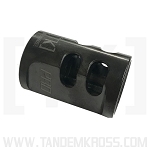 It's easy to replace your existing upper (the entire top of the pistol above the grip). Just remove your factory upper (read the manual), install the original bolt in the replacement and re-assemble. Remember, uppers have serial numbers and need to be shipped to a license FFL dealer. You can upload your FFL license when you order, or send it to [email protected] or fax 320-834-3002. Steel Game Changer Pro Compensator BLACK fits Ruger MK, SW22 Victory, Buckmark, etc. 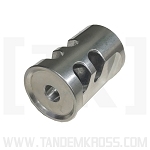 Steel Game Changer Pro Compensator STAINLESS fits Ruger MK, SW22 Victory, Buckmark, etc.